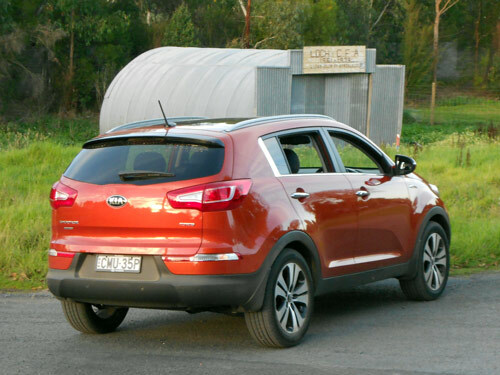 Kia Sportage is a turn-around type of vehicle for Kia, in my opinion. The stylish SUV, with its look-at-me styling, sure is an attention grabber. Sportage has played an important part in Kia's growth in recent years by enhancing the brand's presence amongst smaller SUVs. 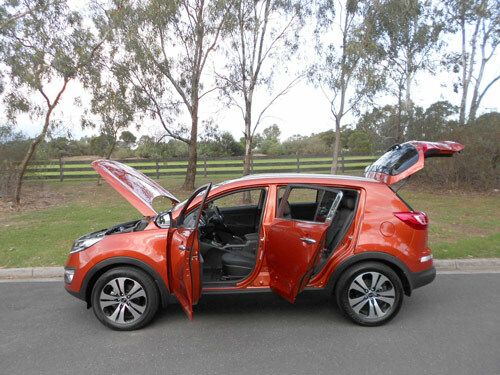 The current Sportage arrived in Australia nearly three years ago. This is the third generation of this popular model. Just quietly, a revision to the Sportage is due soon, very very soon in fact. 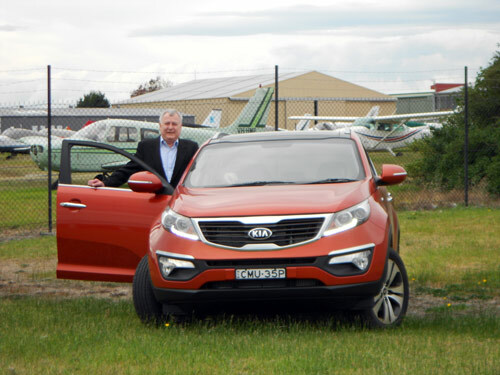 Our test vehicle, for a drive around the countryside in Victoria, is the feature packed Kia Sportage Platinum. Our Techno Orange example was fitted with a diesel engine and automatic transmission. Once upon a time the Sportage was solely a four-wheel drive. But these days, the market is so expansive that there is now room for both 2WD and 4WD models. Currently, the Sportage comes in three trim levels, namely: Si, SLi and Platinum. A two-wheel drive version of the Si is available with a 2-litre petrol engine. This front-wheel drive version is available with either manual transmission or the optional automatic. The manual is priced from $26,990*, automatic being $2,000* extra. A 2.4-litre petrol engine or a 2-litre diesel engine is on offer with the four-wheel drive versions. Prices for the 4WD SLi petrol automatic begin from $32,990*, whilst the diesel version is from $35,990*. The Sportage Platinum with 4WD, petrol engine and auto transmission is priced from $37,000*. 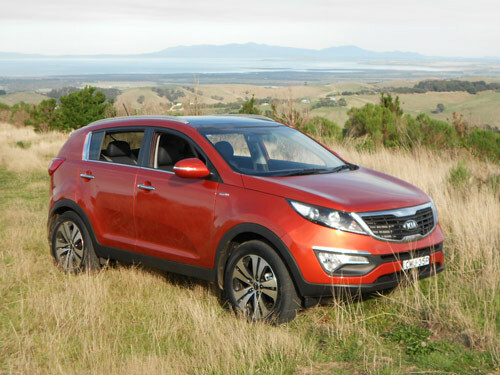 Our test car, the Sportage Platinum 4WD with diesel/auto is priced from $40,000*. Options fitted to the test vehicle included premium paint $520* and satellite navigation $990*, taking the price* of the test car to $41,510*. We consider this to be good value for a top-of-the-line compact SUV that is powered by a diesel engine coupled to an auto transmission and well equipped with a long list of worthwhile features. The displacement of the turbocharged diesel engine fitted to the test car is 1,995cc. Maximum power is rated at 135kW @ 4,000rpm and the torque is rated at a very satisfying 392Nm between 1,800-2,500rpm. The automatic transmission, a six-speed unit, is standard with the 4WD variants, including our Platinum test car. Four-wheel disc brakes, and power steering is standard on all Sportage models. The numbers disclosed by the specs suggest fairly reasonable performance would be delivered by the Sportage diesel. And certainly there are no complaints. We managed to clock up 546 kms of mixed driving conditions - choked suburban traffic, highway cruising, unsealed roads, a little off-road excursion which wasn't difficult and even a little freeway driving. On each occasion behind the wheel I found the Sportage diesel an obliging performer. Perhaps a little noiser than I would have preferred but quite reasonable for this class of vehicle, especially at this price point. Our longest drive on any one day exceeded 400 kms yet we were totally relaxed at the end of that day and, in fact, even ready to do it all over again. The aspects associated with the driving dynamics were rated, by the Next Car team as being average or slightly better than the class average. Nothing was outstanding, but nothing was disappointing. Having said that, though, I state once again that the performance from the turbocharged diesel was pleasing. 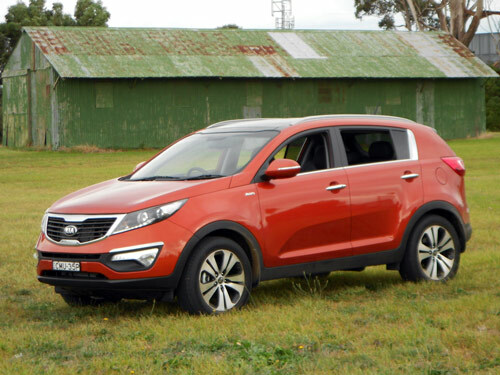 Remember, of course, that the Kia Sportage is an SUV and not a sporty sedan. So roundabouts are taken slower as are sharp turns out in the hills of the countryside. The top-of-the-line Platinum comes well equipped. Leather and fake leather enrich the interior. 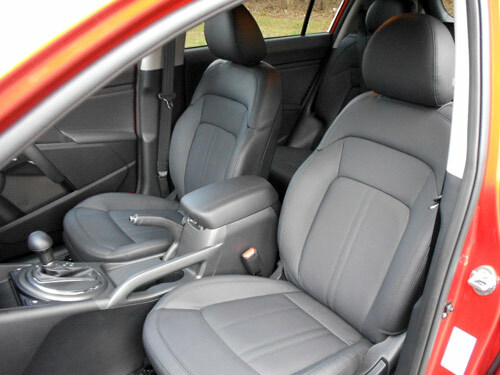 The driver is spoilt by the multi-adjustable power seat that features lumbar support and a ventilation for the driver’s seat. 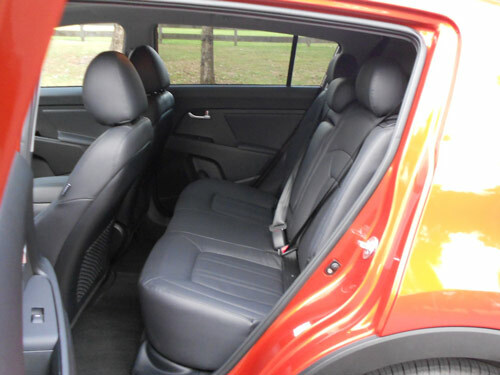 Both front seats have a warming feature which will be appreciated by those with a dislike of winter. Interior space is very good upfront. More than adequate room makes for encouraging satisfaction when you undertake a long drive. Sorry, but we didn't test the back seat on this occasion. The Platinum comes with privacy rear windows, push button starter, a 'cooling' glove box and a comprehensive list of standard equipment, making it a comfortable package for the daily commute and the occasional getaway. Those who enjoy 'connectivity' will be pleased with the Kia Sportage. All models feature AUX/USB input with iPod compatibility and Bluetooth functionality (phone/media stream) for suitable devices. Six airbags, Antilock brakes (ABS), electronic brakeforce distribution (EBD) and electronic stability control (ESC) are standard. The SLi and Platinum have a reversing camera. ANCAP provide the Sportage a five star crash worthiness rating, following the crash testing conducted by Euro-NCAP. The Sportage scored 15.1 out of 16 in the offset crash test. The passenger compartment held its shape well. There was a slight risk of serious lower leg injury. All other body regions had good protection. The vehicle scored 16 out of 16 in the side impact crash test and a further two points in the optional pole test. The diesel has a combined cycle fuel consumption rating of 7.5 litres per 100kms. The city cycle rating is 10 litres per 100kms, whilst the extra-urban cycle rates at 6 litres per 100kms. The onboard trip computer indicated our consumption was 11.2 litres/100km. This figure seems somewhat high. However, the average speed for our 546 kms was just 37 km/h so we obviously burnt a lot of fuel just sitting in heavy traffic. The fuel tank has a capacity of 55 litres. Emissions are rated at 198 grammes of CO2 per kilometre on the combined cycle test. Boot capacity: 740 litres (back seat up), 1,547 litres (back seat down). Sportage can tow a braked trailer up to 1,600kg with appropriate towing equipment. Unbraked, the towing capicity is 750kg. The towball download is rated at 200kg maximum. A 5-year warranty with unlimited kilometres is standard for the Kia Sportage. Roadside assistance is also included for one year. This coverage is renewable for a year if a Kia dealer maintains the car for scheduled servicing. This procedure can reoccur to provide a maximum of five years roadside assistance. Kia is onboard with the popular 'capped price' servicing. Currently, the Sportage annual servicing is priced at $349, $423, $403, $596 and $389 for years one through five. It's good to know what the deal is upfront. This is excellent coverage. Naturally, conditions apply to the warranty, the roadside assistance and the servicing arrangements. 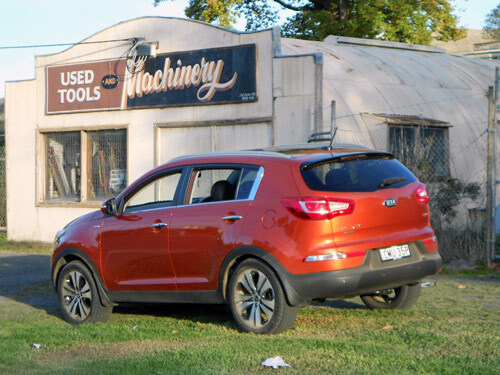 Not only does the Kia Sportage look quite neat, but it is a decent car for a runabout and, for really getting out, we also found it was good for a day in the countryside. Quite reasonable comfort and the elevated driving position meant going here and going there was always a pleasant experience with plenty of enhanced countryside views. Kia is on a good thing with the Sportage! More Kia News ..... here.